This clean, well-decorated vegetarian restaurant that has been in town for many years, though they recently renovated and changed their name from Mercy House to the much more appealing Monorom Garden. The delicious menu here is exclusively vegetarian, but they do include egg on the menu, so vegans will need to ask for their plates without egg. The menu is mostly Asian-inspired cuisine, with Korean and Japanese dishes such as stone-pot meals and teppanyaki, alongside more traditional Cambodian specialties like basil fried rice and a vegetarian lok lak. 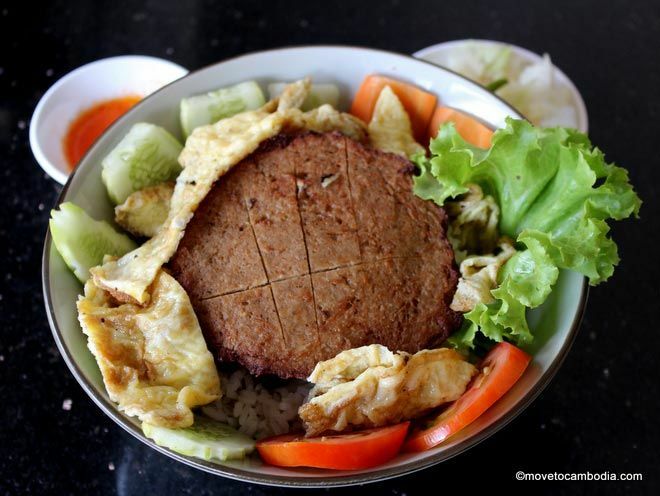 My favorite dish is the simple ‘Japanese Rice,’ a big bowl of white rice with sou phay (fake meat), egg, and fresh veggies. Simple but delicious. This small casual pizza restaurant in the center of town packs an unexpected punch. The menu only consists of seven types of pizzas, all vegan, and each priced at $6. The pizzas are expertly made and really outstanding. The owner was the former chef from the gourmet restaurant Jaan Bai, and it shows. Vegetarian Foods serves inexpensive Chinese-inspired vegetarian breakfasts with fresh soy milk on the side. This little hole in the wall is tucked away near Monorom Garden, and if you blink you might miss it. Not very glamorous, Vegetarian Foods Restaurant seems to appeal to locals and the more adventurous vegetarians in Battambang. But don’t let looks deceive you; the food is pretty delicious. It’s even good for traditional Khmer breakfast — the noodle soup is on point! The menu features an array of mostly Chinese-style vegetarian food, much of it made with soy faux-meat products. Dishes are inexpensive, costing between 4,000 and 5,000 riel ($1 to $1.25 USD). They also make their own fresh soy milk every day in several flavors. As previously mentioned, all the restaurants that cater to expats in Battambang have vegetarian options, but Riverside Balcony takes it to the next level with homemade vegan cheese. As any expat in Battambang will tell you, the pizza at Riverside Balcony is top notch, so this non-dairy cheese opens up a world of pizza for Battambang vegans. The chef makes the delicious cheese out of cashews, and even has a vegan pizza listed on the menu. It isn’t super cheap, but it’s totally worth the money. In what used to be Chenda’s restaurant is now Bar Ang, and they are just as dedicated to plant-based eating as the former occupant. They serve breakfast, lunch, and dinner, and all dishes can either be made with meat, or to suit vegetarians or vegans, so it’s a nice compromise restaurant for mixed omnivore and vegetarian groups! Dishes are inexpensive, with most priced between $3 and $5. They grow many of their own vegetables, and use fresh coconut cream, palm sugar and limes from the owner Anut’s property. And there you have it! Like I said, there are tons of options for eating vegetarian in Battambang. These are the three that are specifically vegetarian. 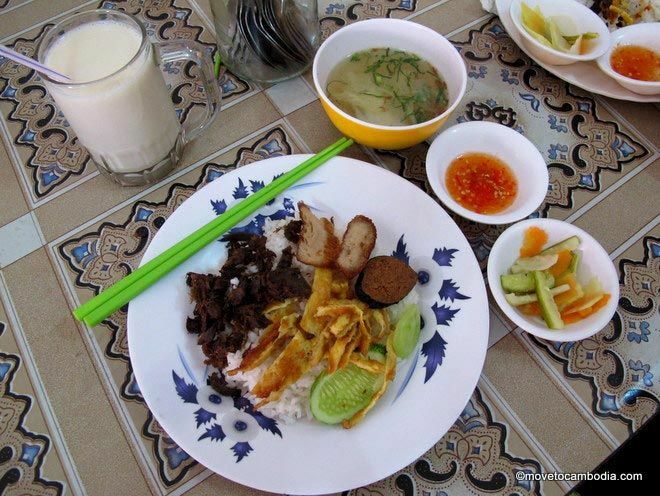 If you find yourself in Battambang, don’t be afraid to explore, because most restaurants in town have some vegetarian choices. Even if you aren’t near a tourist restaurant, as long as you know the right words you can usually get vegetarian food anywhere you go. 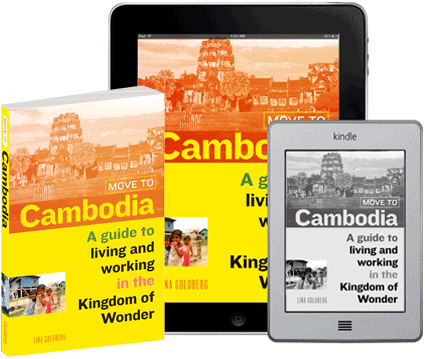 Check our post on eating vegan and vegetarian in Cambodia to learn some handy vocabulary and get printable Khmer menu cards to take to restaurants. Open daily, 7:30 a.m. to 8 p.m.
Open daily, 6:30 a.m. to 8 p.m.
Open Tuesday through Sunday, 4 to 11 p.m.
Open daily, 7 a.m. to 11 p.m. 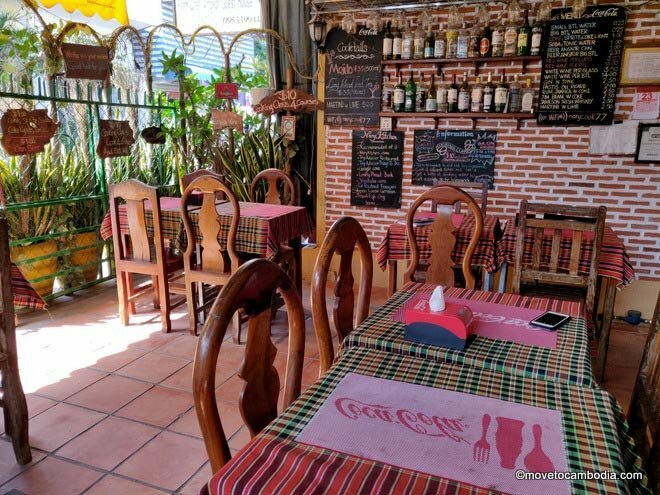 This entry was posted in Battambang, Food and tagged Vegetarian, vegan and vegetarian, Monorom Garden, Riverside Balcony. Bookmark the permalink. 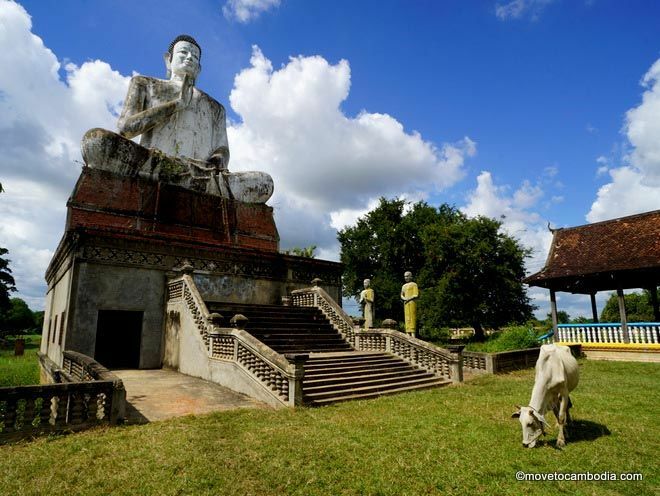 ← Happy Khmer New Year!